The Test Scores Are In! It is not necessary to be intelligent to be wealthy. There are many Millionaires in America who let financial advisors handle their investment strategies and other financial decisions because the Millionaires do not know enough to make the proper decisions themselves. But how pervasive is that characterization? How many Millionaires are uneducated in the ways of high finance and investment terminology? Spectrem decided to find out. 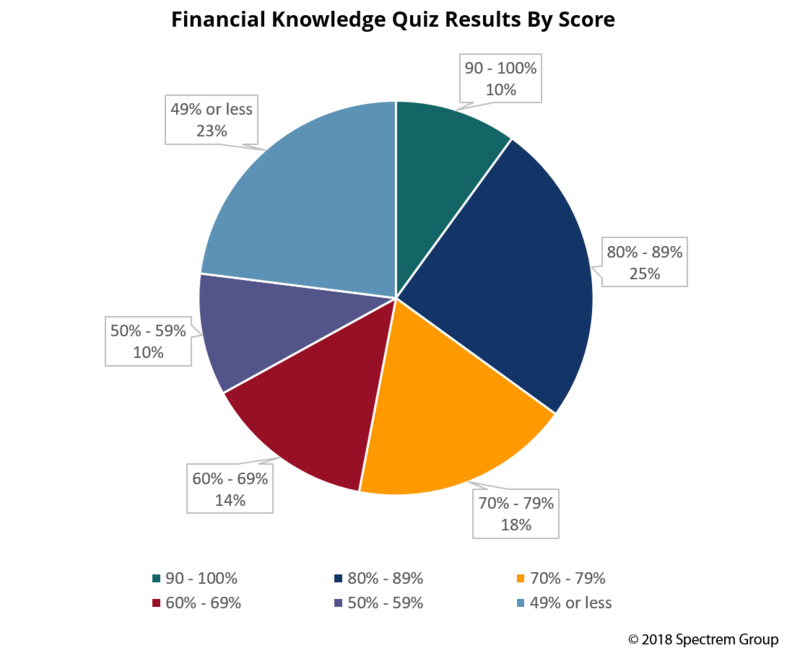 In its new study The Financial Literacy Gap Among Millionaires, Spectrem asked investors 23 questions about financial terminology and definitions to determine just how much educating financial advisors need to do to get their client investors up to speed on the details of the decisions the investor and advisor make in tandem. Out of the almost 1,000 Millionaires who took the test, only 10 percent got what amounts to an A, by getting 90 percent of the questions correct. Another 25 percent got between 80-89 percent correct, and 18 percent got 70-79 percent correct. That’s 53 percent of Millionaires who received a passing grade on the test of financial and investment knowledge. On most questions, Millionaires were given a choice of definitions to choose from, but were also given the chance to answer “I don’t know.” For example, when asked what the acronym ETF stands for, 81 percent of Millionaires knew it stands for Exchange Traded Fund, while 16 percent could not make a selection from the three choices offered. Ninety percent of Millionaires knew the correct definition of a mutual fund, and 91 percent knew Certificates of Deposit are one of the investments with the lowest risk compared to several other choices given. But there was a scattered response to the question “Which index tracks the most companies?”, with 35 percent selecting the S&P 500, 33 percent selecting the NASDAQ and 23 percent selecting the Dow Jones Industrial Average. NASDAQ, which tracks approximately 3,000 companies for its composite index, is the correct answer. What is most revealing for advisors is the percentage of investors who simply stated “I don’t know’’ to answer some of the questions, such as the 14 percent who could not identify annuities when given the definition of the term, or the 36 percent who could not pick out an incorrect statement about robo-advisor services from a list of three. The study also shows how investors performed on the test based on their financial educational background, matching results to those investors who took a financial literacy course in their high school or college days versus those who did not. Advisors need to know what their investors know about certain investment topics. They also need to know how much their investors want to know about those topics. Many investors believe an advisor should assist clients in becoming educated on matters about which they are likely to discuss in advisory meetings, but there are also investors who do not care to be educated on those matters and trust in their advisor to know enough to make wise decisions with their investable assets.